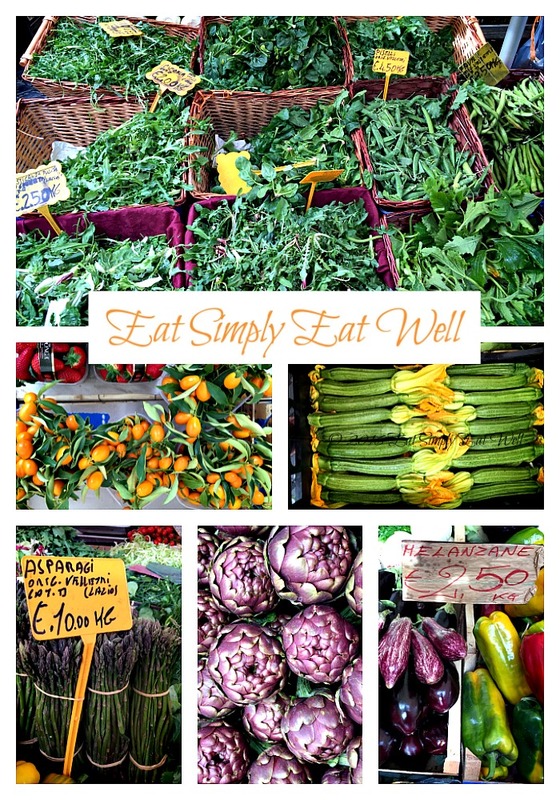 A recent trip to Italy has inspired me to cover my table in seasonal fruits and vegetables. Leaving a snow-covered Helsinki behind, we arrived in Rome to sunny-cloudy skies, early buds just emerging on trees, low levels of tourists (a huge win!) and pleasant temperatures that required only a light jacket and scarf for warmth while touring this beautiful city. Rome is one giant museum, and best seen by walking around, so we were glad we’d packed great walking shoes. Everywhere you look, there are bits and pieces of ancient Rome, with layers brought in by all the subsequent generations, each looking to make their mark on the city they call(ed) home, while literally and figuratively building on the work and lives of the city’s previous residents. 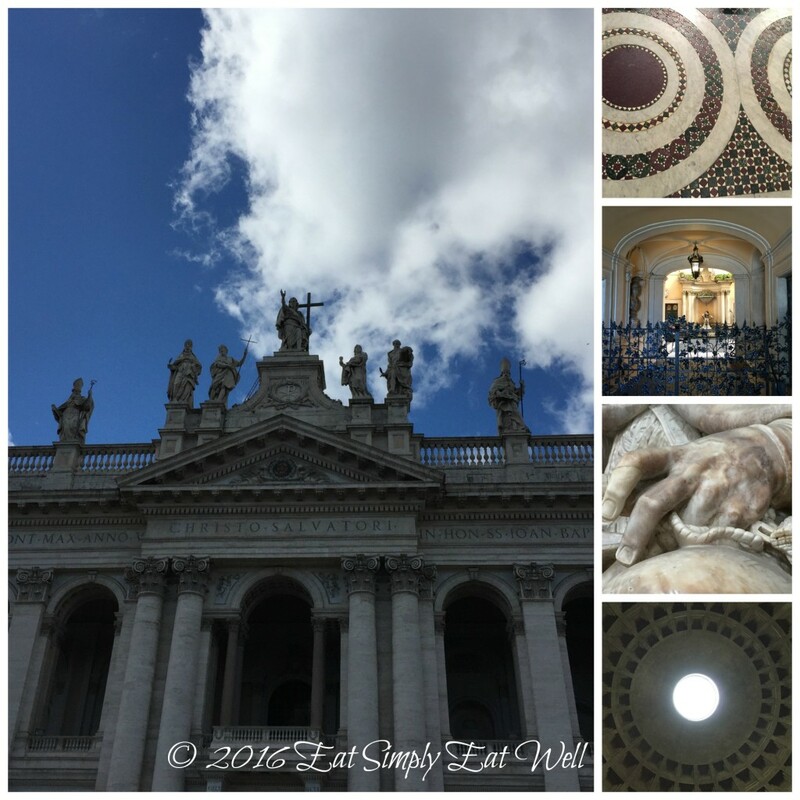 We visited the major sites: the Colesseum, Forum, Pantheon, Vatican, St. Peter’s Basilica. We stepped inside multiple churches to enjoy the intricate architecture, artwork, and in some delightfully surprising cases, groups of locals singing and enjoying their daily lives. 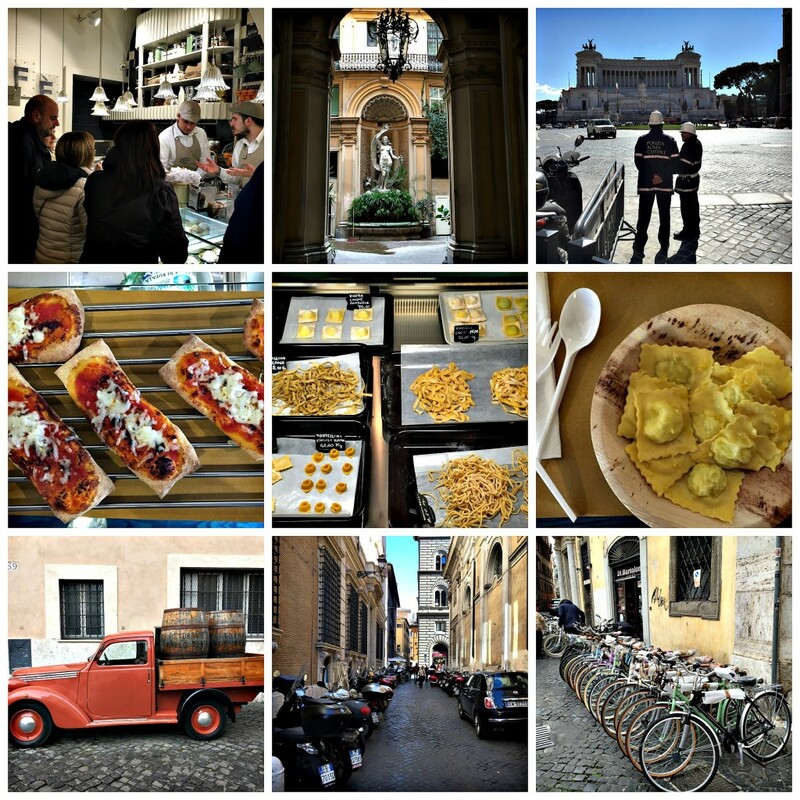 We wandered down winding side streets leading to courtyards and plazas and parks in the back streets of Rome. We took selfies and panorama shots, alongside other tourists from around the world, in front of the fountain by the Spanish steps; from the rooftop of Castle d’Angelo, in front of ruins in the Jewish Ghetto, in the midst of headless statues inside the Forum. We sat overlooking the Tiber river, watching the world go by, enjoying the unscheduled days and the warmth of the Spring sunshine. …and the more surprising and enjoyable offerings on the menu: arugula salad topped with fennel and orange; local goat cheese and toasted hazelnuts on dark greens; zucchini, sundried tomato and pecorino souffle; Roman-style artichokes – Carciofi alla Romana; and became completely addicted to Brutti ma Buoni – the “ugly but delicious” cookies made from toasted hazelnuts – a completely irresistible chewy-crunchy (we went back to the same bakery 3 times). We enjoyed gelato from Gelateria del Teatro – more than once. We consumed many, many oranges and blood oranges – too many to count. We drank cappuccinos literally all over the city, soon discovering our favorite places for the first cup of the morning, the second cup an hour or so later, the place to go after lunch, the mid-afternoon pick-me-up. 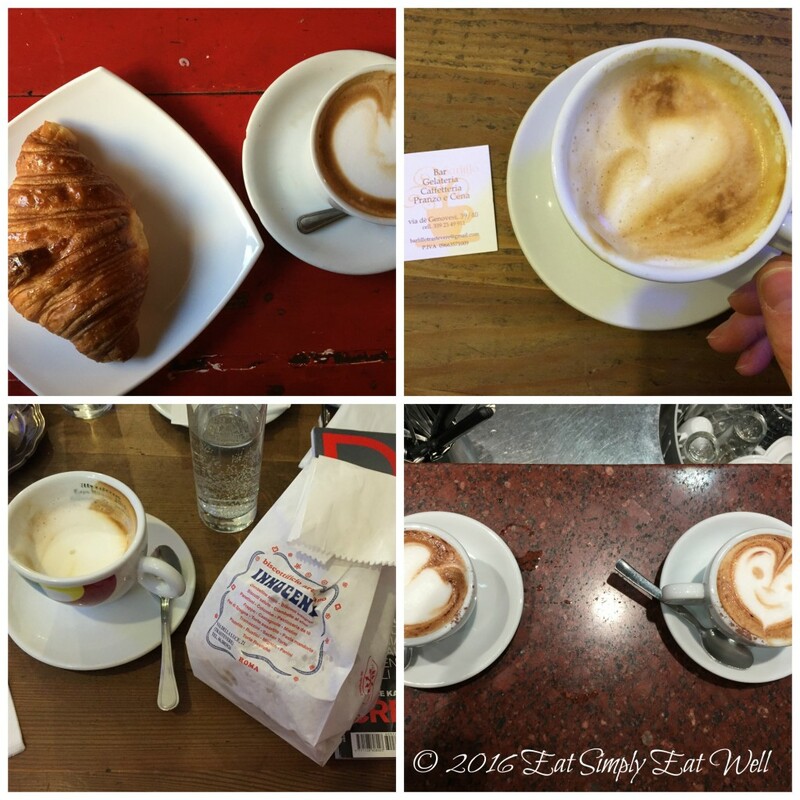 When in Rome… We drank coffee as the locals did: standing up at the coffee bar, knocking back a freshly pulled espresso shot, or sitting at the outside tables, enjoying a cappuccino while watching the world go by. The local pasta and pizzas are great, but eat these daily and you’ll soon be craving vegetables – the pasta dishes tend to be very simple, for example the cacio e pepe made with cheese, butter or olive oil and black pepper over pasta – a delicious dish, but one screaming to be served with a side of vegetables or a salad. One trick is to ask for two plates and share the pasta dish, and then order several of the vegetables or salads along with it. Trust me, your gut, waistline and energy levels will thank you for this. The most interesting dishes were found in from the list of appetizers, side dishes or salads. 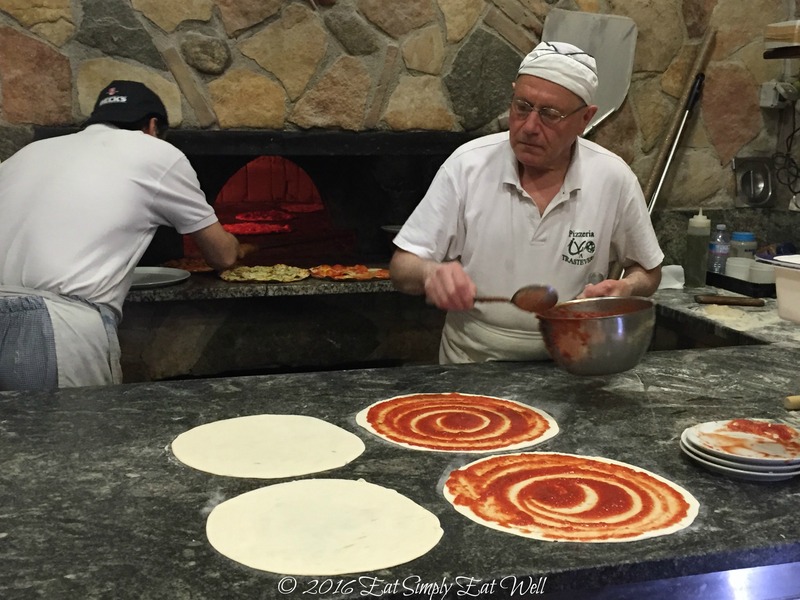 It is here that the local chefs are most adventurous, and where some of the best food in Rome. Sometimes, we ordered only side dishes – and these turned out to be our best meals. Local markets let you see what’s in season. During our visit in early March, the markets were loaded with wild asparagus, broccoli rabe, and artichokes. So whenever we came across these items on the menu, we ordered up! Wise choice – they were always fresh and delicious. The broccoli rabe at Pizzeria del Francesco was steamed and then dressed with garlic toasted in olive oil and a generous douse of black pepper – a perfect predecessor to the crisp pecorino, wild asparagus white pizza, topped with a fresh egg and baked in the wood-fired oven. Don’t rely only on the guide books – their recommendations will likely lead you to places overcrowded with tourists and dishes that are less than stellar. Instead ask a local in their late 20’s thru early 50’s where they eat. They are likely to give you the address of the trendier new restaurants cooking up Italian food with a modern twist. If the menus are in English only, skip it. If you’re looking for food after visiting a tourist attraction, follow the “rule of 3” shared with us by tour guide Chad: turn your back on the tourist site; walk 3 blocks in any direction and the food will be 3 times better and 3 times cheaper. It’s true. Don’t look for dinner before 7:00 PM. Expect to pay extra for bread, water, plus a service fee. You want a restaurant in which (most) of the guests are speaking Italian. If not, keep walking. The best food is found on the side streets in smallish restaurants. Use the local WiFi to check out “restaurants near here” on Google maps. You’ll get up-to-date comments from people like you about restaurants in the vicinity. We had really good luck with this, and found one of our favorite restaurants, dar sor Olimpio al Drago in Trastevere this way. Be adventurous. Try foods you’ve never heard of. Share dishes so you can enjoy more new flavors without stuffing yourself. dar sor Olimpio al Drago, Piazza del Drago 2 in Trastevere – Impeccable service in a charming restaurant, and where we found one of my favorite dishes of the trip: a souffle of pecorino cheese, zucchini and sundried tomato. Everything on the menu was excellent. Unusually for us – we ate here twice! Gelateria del Teatro, Via dei Coronari, 65 – This is one place where the guide books get it right – truly the best gelato in Rome with authentic gelato flavors masterfully made in-house. Your only regret will be limited capacity as you’ll want to try every single flavor. 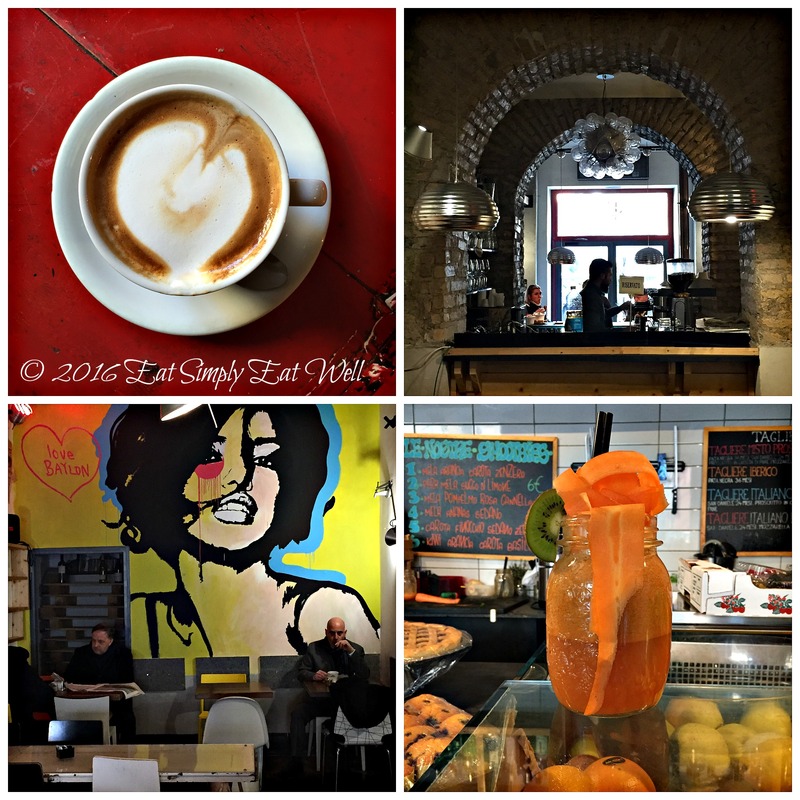 Baylon Cafe, Via di San Francesco a Ripa 152 in Trastevere – fresh juices and the best cappuccinos in the city. Also serves breakfast, lunch and dinner. Well-loved by the locals and has a wonderful staff and decor that made me smile. This place really felt like “home”. 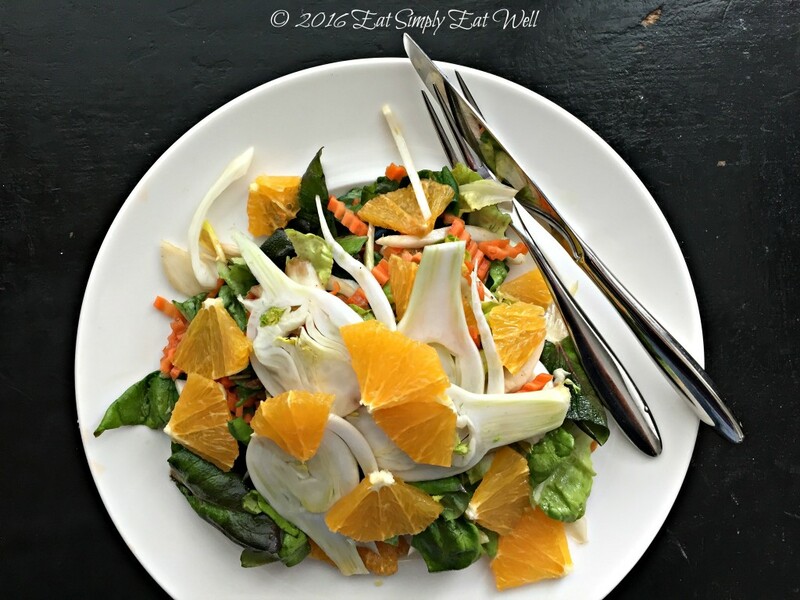 In case it may be a while before you visit the Eternal City, here’s a refreshing Spring salad inspired by our trip. This simple combination makes the best of a few ingredients, so look for the best quality of each that you can find. This will be on our Easter table, reminding us of those delightful days in Rome, and promising that Spring is nearly here – even in Helsinki. 1 fennel bulb, thinly sliced lengthwise, reserving 8 whole slices from the center. Wash the dark greens and spin dry. If large, cut into bite-sized pieces. Place the greens in a large bowl. 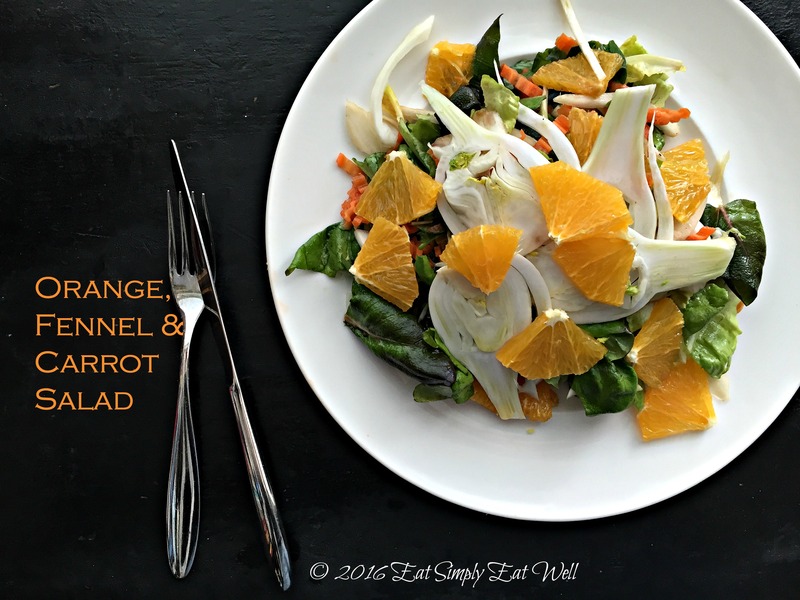 Add the fennel and orange except for reserved slices, and the carrot pieces. Add salt, pepper, olive oil and vinegar. Toss well to coat vegetables with the dressing. Divide the vegetable mixture between 2 plates for a main course and 4 plates for a side dish. Garnish with reserved fennel and orange slices. Serve immediately. Serves 2 as a main course and 4 as a side dish. Have you been to Rome? Share your favorite food stops and tips in the comments below! Dreaming of Rome? What would you love to see or eat there? Beautiful pictures! After reading this post I had a strong urge to book a ticket to Rome 🙂 The Salad looks so refreshing, will definitely try it!